Are you moving out of your house? Then you’ll probably be doing some heavy duty cleaning of the house you’re moving out of. Restoring the house you’re moving out of to be just as clean as before you moved into it may be a long process. Make a checklist of the areas you have to clean before you leave, and also make a checklist of the things you have to clean in your new home. Make sure you check with your landlord to see if he/she has made note of what condition the house was in to check for any specific areas you may need to restore. If you hire a cleaning service, make sure that they only do what needs to be done, and don’t do any extra services that aren’t needed. If you leave the house in good condition, your security deposit will be returned. There are many areas of the house that may need special cleaning attention. The kitchen can become difficult to clean because it gets a lot of wear and tear due to high usage. The kitchen’s appliances, such as the exhaust fan, will also need to be thoroughly cleaned. Cooking with oil and grease is common in a kitchen, causing a layer of grease to develop on the nearby windows and walls, so make sure to look out for those pesky stains. Another area that will probably require a significant amount of time is the bathroom(s). Bathrooms never go through a long enough period of rest time to stay clean. 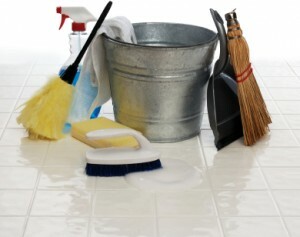 Tubs, toilets, showers and sinks will need to be scrubbed well with a proficient bathroom cleaner. Make sure to clean the tiles as well, and also clean and whiten the grout. The medicine cabinets will also need to be cleaned out and wiped down. Something that goes unnoticed in cleaning a house/apartment/condo that you’re moving out of is the walls. Walls get scuffed from furniture, stained from food, beverages or oil, and get bumped into by toys and what not, so making sure the walls are clean and patched up is also important. Fill the small holes, where pictures were hung, with wall filler. If there’s a bigger hole, wall-filler works as well, but you will need to re-paint the area. Clean away scuffmarks with a light mix of scouring powder and water. Make sure to plan out what you need to restore and how you’ll going about restoring it.